Shae is one of the two females we retained from Mischief. She lived with Angela for her first five years, but she moved back to Arkansas in 2013 to help Rose Marie with the chores. Physically, she is a strong, compact girl much like her dam. 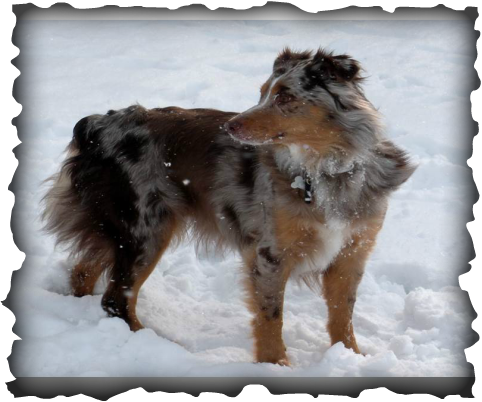 She is on the shorter side of the breed standard, but she has a lot of solid bone in that little body. In temperament, she has her dam’s alpha personality along with an exceptionally strong dose of her sire's “want to please” attitude. She is a fast, high energy, and a very driven dog. The word that best sums up Shae is "intense." While Angela has not had much opportunity to work with Shae on stock, Rose Marie has taken her out a few times to work the cows in Arkansas. Shae has lots of drive, hits both heads and heels, and works nicely in tight spots like the chute. She is a quiet while working stock and bites low. She does require a strong handler or she "forgets" to stop. was adored by Angela's cat, possibly because she knew that Shae would always take the blame when they got into trouble together. Shae is more reserved around strangers than many of our other dogs. She will simply take a step back if a stranger tried to pet her in agility class or while taking walks around town, but she becomes protective, particularly around strange men, on home turf. Angela was living alone when she decided she needed Shae as a graduation present for herself, and Angela's upstairs neighbors had the police visiting fairly frequently so a slightly more protective dog was a major plus in her opinion. Angela was training Shae for agility in Missouri, and she showed lots of promise (probably more than Angela did). However, Angela moved to a new state right before Shae was old enough to start trialing, and its taken Angela a long time to find a mechanism to continue the training. Shae is more handler-driven and less target-driven than Angela's previous agility companion, Gypsy, so it was easier for a novice handler to send her off course. Shae does have lots of energy and speed and when she's good she's very good. Of course when she was bad.... well you know. (The agility trainer did nickname her "wild child" for a period of time.) Shae has an excellent sense of where her body is at all times and a good deal of coordination and balance. I have a private theory that this same sense of coordination and balance is what makes a good chute dog, and, if its true, it would be a nice link between farm work and agility. Angela got a kayak for Christmas so she and Shae tried it out on the Buffalo River. Shae happily perched on the front of the kayak the whole float trip! She could not have been a better navigator, and we couldn't resist posting a picture even if it is just a snapshot from the phone's camera. Shae tested Normal/Normal. i.e. not a carrier, for the following mutations MDR1 (Ivermectin Sensitivity), Collie Eye Anomaly, Cone Degeneration, Canine Multifocal Retinopathy 1, Degenerative Myelopathy, HSF-4 Hereditary Cataracts, Neuronal ceroid lipofuscinosis 6, and Progressive rod-cone degeneration. Shae tested Normal/Mutant; i.e. a carrier, for Hyperuricosuria. This means that she and any pups she produces when crossed with a Normal/Normal male will not be predisposed to bladder stones. However, if she is ever bred to a male that carries one or more copies of the mutant allele, some puppies may be predisposed to bladder stones. *Our focus has always been and will continue to be temperament and instinct consistent with the old working Aussies. However, we do our best to also maintain healthy lines. We try to sensibly use current technology to help in this goal. After all, healthy dogs are needed for farm work so we are starting to utilize some of the genetic testing options available. I am not completely confident on prioritization and interpretation of the genetic testing , but Pawprint Genetics did answer some of my questions in a reasonably convincing manner. Here is their feedback to me if it helps: Link to Feedback.